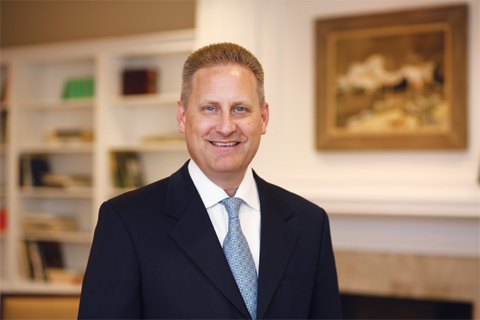 In a world where many believe rigorous study of the Bible is waning, Hobby Lobby President Steve Green's passion for engaging Christian minds drew him to like-minded individuals at Baylor. For years, the Green family has supported the distribution of Bibles around the world through various ministries. But in November 2009, an opportunity arose to get involved in spreading the Bible's messages in a different way. The Greens were able to acquire a biblical artifact that set them on a course to develop a significant collection of international renown. Once they started buying and word got out, more people started contacting them. "Some people needed to turn their collections into cash, and some just liked what our vision was and so they would sell," Green says. "We basically had no idea that a few years later we would be where we are today. But we just felt like, 'God's got a plan.' He has entrusted us with the collection we have, and we just feel the responsibility of sharing the Bible story that the collection tells in an engaging, powerful way, and that's what we're pursuing." Over the past few years, the Green family has become involved with the university through Baylor's Institute for Studies of Religion (ISR) and the Green Scholars Initiative (GSI). A partnership with the family has established Baylor as a major research partner and an academic home for the GSI's primary undergraduate program. Baylor plays a leadership role in providing undergraduate and graduate coursework and research. At least a dozen Baylor professors from various departments are participating with Dr. David Lyle Jeffrey, Baylor ISR Distinguished Senior Fellow acting as the ISR Director of Manuscript Research in Scripture and Tradition. "Baylor was chosen because of the staff that is being built in biblical studies with Dr. Jeffrey, Dr. Byron Johnson and the ISR program," says Green. "It all indicated that there is an intent here that fits right in with what we are doing with the Green Scholars Initiative, so we felt it was a perfect fit. And as we are continuing to expand the program with the collection, there are a lot of items that we find that need to have further study done and need to have publications done on them." Baylor hosts an annual gathering for the Green Scholars Initiative network (with students and their campus mentors selected through a vetting process). The most recent conference, the Logos Institute, was held at Baylor in June (read more on page 18). Green and his family attended the weeklong conference. "We wanted to bring some of these very bright students in and help ground them in the truth of God's Word so that as they are seeing some doors open for them, they can have a positive impact on academia going forward," says Green. "I see this as our long-term play. Over the next 10 to 20 years, these students can be teaching biblical studies as professors at leading universities and hopefully be very academic in what they say, but not antagonistic, because that's what seems to happen at so many universities. We're hoping that these students will be able to have a great impact going forward." Green now devotes half of his time to The Green Collection, which has four facets: a collection of more than 40,000 biblical antiquities, including one of the largest collections of cuneiform tablets in the Western hemisphere, portions of the Dead Sea Scrolls, a large section of a Gutenberg bible and a working Gutenberg press replica; Passages, a traveling exhibit of artifacts; a future museum to house the collection in Washington, D.C.; and the Green Scholars Initiative. The most important piece of the collection is Codex Climaci Rescriptus, one of the world's earliest surviving Bibles. Using a new technology developed by Oxford University, scholars have uncovered the earliest surviving New Testament written in Palestinian Aramaic -- the language used in Jesus' household -- found on recycled parchment under a layer in this rare manuscript. It and many other artifacts from the collection were on display at Baylor's Armstrong Browning Library in April 2011, before the items began a tour of several locations, such as the Vatican, Atlanta, and Green's hometown, Oklahoma City. The traveling exhibition Passages will eventually form the core of a permanent, international, non-sectarian museum of the Bible. This site will enable visitors to interact with the history and impact of the best-selling, most-translated book of all time and will house the Green Scholars Initiative, bringing together established and young scholars to pioneer new biblical discoveries. "It's exciting to be able to engage leading scholars around the world, including those at Baylor, to study the items so that when we have a museum, we will be able to say with academic credibility that this is what you are seeing and what story this item may tell," says Green. Green's faith isn't only seen in his side work; it's also evident in how he runs the family business. He is proud that the company his father, David Green, started operates according to Christian ideals. In today's world, it is rare for a company so large -- more than 500 locations across 41 states -- to play Christian music in stores, close on Sundays and pay rates far above minimum wage to all full-time employees. The current federal minimum wage is $7.25 per hour, but Hobby Lobby announced in April that their company's minimum wage for full-time workers was raised to $13.00 an hour. "There was a time in our company when we couldn't have afforded to do that, but we've grown to the point that we are able to do it, and it's been exciting to reward the employees who are working hard every day. My dad said that he never was as excited about doing anything on the business side," says Green. "When Dad started opening retail stores, he knew there were certain Christian principles that applied, so it's just always been the model that we've lived under," he explains. "My dad had been taught by his parents, just as my parents taught us, that we want to live our lives according to biblical principles because we feel like that's the best life you can have." For more on the Green Collection and Baylor's involvement in the Green Scholars Initiative, visit explorepassages.com and baylorisr.org.